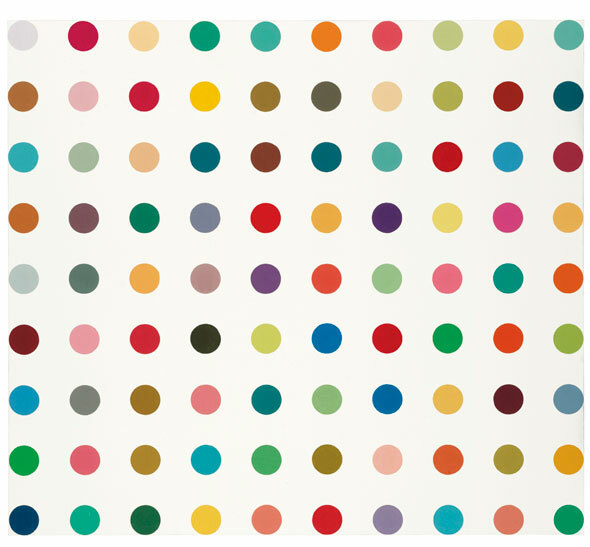 The world – well Gagosian Gallery, anyway – has gone dotty for Damien Hirst’s spot paintings. In an unprecedented move, Gagosian is showing a single artist across all its sites, and not just a single artist but a single strand of that artist’s work. The Complete Spot Pantings 1986-2011 is on now at all 11 Gagosian spaces globally. Why? What’s it all about? Gathering the spot paintings in order to exhibit them must have been an extraordinary undertaking and possibly a risky one for the lenders as well as for Hirst and Gagosian; more than 300 paintings are on show, borrowed from over 150 lenders – mostly private individuals and public institutions – from around the world. This exhibition seems like an experiment that could easily devalue Hirst’s work, but the finer points if the art market aren’t something I feel equipped to talk about in depth right now but this does seem like a curious move, especially in a time of such economic uncertainty. As a challenge the gallery will reward anyone who visits all 11 sites with a print signed by Hirst. Quite who would taken on this challenge who knows, and the coffee bar style card to acquire 11 stamps in order to get the free print is a strange move. Hirst’s spots have been ubiquitous for years now, will this prove to be their death knell or encourage a reexamination of them. 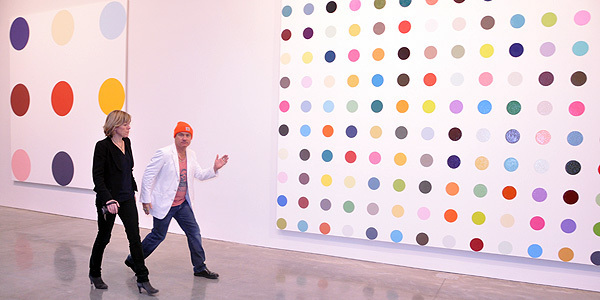 Certainly the spot paintings raise all sorts of questions about authorship – Hirst painted only four of these himself, the rest were made by studio assistants – and the Warholian idea of the artist’s studio as factory. The role of the artist and the relationship between master and student or artist and studio assistant is a long and complex one but Hirst is a figure who engenders knee-jerk responses so may not be the ideal focus for such discussion. And of course there’s the question of whether the spot paintings are any good? I’ve always assumed that they were effectively the steady income stream that let Hirst do other things; but despite my scepticism, I’ve always rather liked them as paintings. That might well change with so many on show at once (though I’ll only see the two London shows). 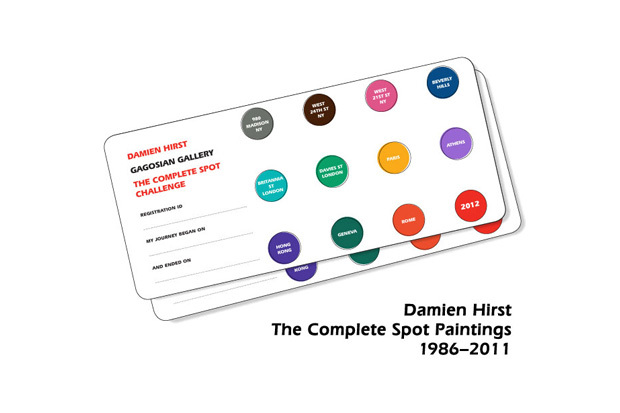 The Complete Spot Paintings 1986-2011 is on show at all 11 Gagosian spaces globally from 12 January 2012. End dates vary from 10 February to 17 March. The exhibitions at the London and New York spaces all close on 17 February. This entry was posted in Galleries, Painting and tagged art, Athens, Beverley Hills, Damien Hirst, Gagosian, Geneva, Hong Kong, London, New York, painting, Paris, Rome, spots by Ann Jones. Bookmark the permalink.